The Ku Klux Klan cannot continue leafleting streets according to a U.S. Circuit Court of Appeals. However, the American Civil Liberties Union is appealing the ruling that prohibits the Ku Klux Klan from leafleting in the streets of a small southeast Missouri town. In a 2-1 ruling last week, a panel of the 8th U.S. Circuit Court of Appeals sided with the city of Desloge, whose leaders argued the ordinance is meant to protect public safety by keeping people out of the street, not suppress free speech. ACLU attorney Anthony Rothert said Wednesday that the case will be appealed to the full 8th Circuit. 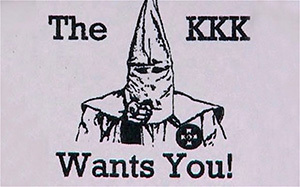 The KKK sued in 2012 after its members were prohibited from handing out fliers to motorists in Desloge, a town of 5,000 residents about 60 miles southwest of St. Louis. ACLU attorneys claimed the ordinance violated the white supremacist group's right to free speech. A federal judge in October 2013 issued an injunction that prohibited Desloge from enforcing its law, but the 8th Circuit's panel reversed that. "There is no evidence that the August 2013 ordinance was created to curtail the Klan's message or its speech in the city of Desloge," the court wrote. In the dissenting opinion, Circuit Judge James B. Loken said the lower-court judge was correct in noting that the Desloge law "silenced an unpopular speaker in a traditional public forum." Phone calls to Frank Ancona, a Missouri-based imperial wizard with the Traditionalist American Knights of the Ku Klux Klan, went unanswered Wednesday. Desloge City Administrator Greg Camp said the ordinance addresses a "public safety concern" and is applied to scouts, youth baseball teams, firefighters and others who pass out leaflets while standing in the street. "We had been witnessing this since before this started with the Klan," Camp said. "It's frustrating at times because this has been portrayed as a Klan vs. Desloge issue, but from our perspective, it never has been." The ACLU won a similar suit in 2012 on behalf of the KKK against the city of Cape Girardeau. And in 2013, the ACLU reached a settlement with the city of Poplar Bluff after resident Brian Becker was ticketed for leafleting in opposition to a sewer bond initiative. Poplar Bluff agreed to rescind its anti-leafleting ordinance. Court records show that the leaflets Klansmen regularly pass out address topics that include the dangers of methamphetamine to the "White Race," warnings about "violent black on white crime," and defending "White Christian culture."